With the Jarrett Cherner Trio in Washington, Oregon and California. 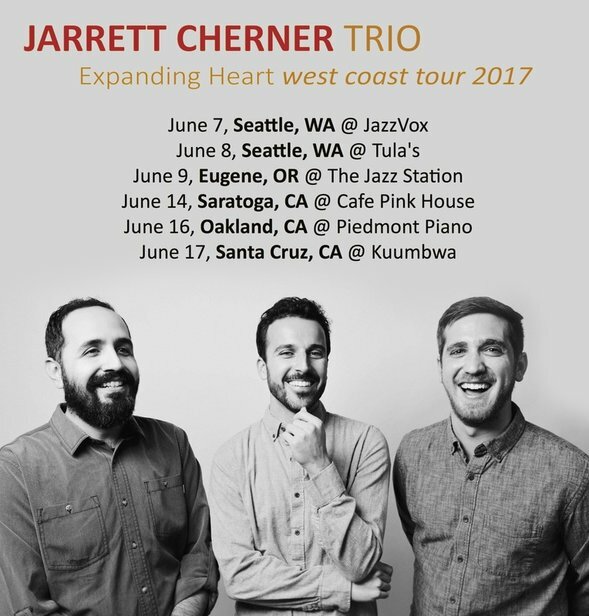 Pianist Jarrett Cherner is proud to announce his multi-city west coast tour with the Jarrett Cherner Trio. The Brooklyn-based pianist has emerged as one of the most compelling young musicians on the jazz scene, beginning with his fine trio debut Burgeoning (BaldHill) in 2006. In recent years he has devoted the bulk of his composing to the collective jazz quintet Sketches (sketchesmusic.com), which has two critically acclaimed albums to its credit: Sketches Volume One (BaldHill, 2013) and Volume Two (Brooklyn Jazz Underground, 2014). This tour follows the October 2016 release of Cherner’s album “Expanding Heart”, which also featured Jorge Roeder and Jason Burger. ‘Expanding Heart’, is a recording that reflects personal growth and combines original material with covers of wildly disparate songs by Vincent Rose, Otis Redding and Ornette Coleman. The album was released by Baldhill Music and continues to gain some significant attention with reviews from Jazz Weekly, All About Jazz (4 star review), Goldmine Magazine and Boston Concert Reviews. Cherner, alongside bassist Jorge Roeder and drummer Jason Burger, will kick this tour off with a house show presented by JazzVox in Madrona, Seattle on June 7th at 7pm (doors: 6:15pm). Tickets are available here and the suggested donation is $30. The trio will then present two sets (7:30pm & 9pm) at Tula’s, located at 2214 2nd Ave, Seattle, Washington on June 8th. For tickets, call 206-443-4221 or email reservations@tulas.com with the following information: reservation date, time, number in party, last name for reservation, and phone number. On June 9th, this group of respected musicians will make their way down to Jazz Station, located at 124 Broadway, Eugene, Oregon. Tickets for this 7:30pm set are $12 and are available here. Café Pink House, located at 14577 Big Basin Way, Saratoga, California, will proudly present this trio on June 14th at 7:30pm. Tickets are $15 adv / $18 door and are available here. On June 16th, the Jarrett Cherner Trio will perform at Piedmont Piano, located at 1728 San Pablo Ave., Oakland, California at 8pm. For tickets ($20), call (510) 547-8188. Finally Cherner and his trio will bring this tour to a close on June 17th at 9pm (doors: 8:30pm) at Club Kuumbwa, located at 320-2 Cedar Street, Santa Cruz, California. Tickets will be available at the door and more information on the event is available here.